Based on ten years of wide-ranging research, Alan Walker has produced the most comprehensive biography and musical analysis to date on Poland's most famous musician and composer. Walker is already well known for his scholarly three volume work on Chopin's contemporary, Hungarian virtuoso pianist and composer, Franz Liszt. Chopin's music was colored by the sorrows stemming from political upheavals in Poland during his lifetime. He was born near Warsaw in 1810 of a French father and a Polish mother. By age seven, he had published his first musical work, a Polonaise, and was already being compared to Mozart, another prodigy. He was to go on to become a largely self-taught piano virtuoso. In 1830, at the young age of 20, he left Poland, then seething with revolutionary discontent, never to return. In Paris, he began a career as a prolific composer of piano works with a Polish flavor. His audiences adored him. His mazurkas, Polonaises, waltzes, nocturnes, sonatas, etudes, and impromptus were flavored with the melancholy of his homeland's 19th century sorrows. They have become among the greatest works of the piano concert repertoire. This book describes his relations with other contemporary Romantic music giants—Mendelssohn, Rossini, Berlioz, and Liszt. The author shows examples of parts of Chopin's piano scores with a detailed analysis. 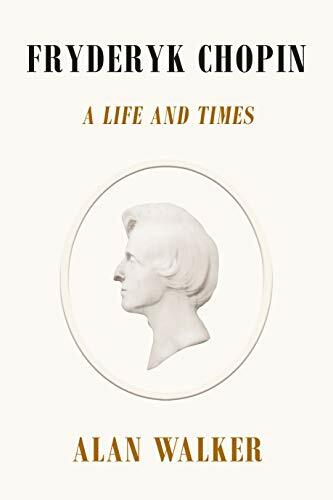 In addition, it contains a Chopin family tree, a general catalogue of his works, an index and several chapters on the tumultuous personal life of George Sand (Aurore Dudevant) and her stormy nine-year relationship with Chopin. During the time they lived to together, he produced his most creative work. He was devastated when Sand suddenly ended the relationship. Both his creativity and his physical health plummeted, and he died soon afterward. Walker shows that Chopin's musicianship and persona were of one piece. His upbringing, travels, people, musicians whom he met and the political climate in which he was born are all interwoven into the plot. This work could not have been as complete if Chopin's personal life were ignored. "Chopin's compositions are woven so closely into the fabric of his personality that the one becomes a seamless extension of the other . . . Chopin's music everywhere keeps an interest in his life alive." And that is what makes this biography different from any others. Not only was he a musical genius but also showed an unusual gift for mimicking facial expressions and voices and a talent for drawing. Despite his frail health, he was a hard worker. He even tried horseback riding at one time. He traveled all over the countryside and heard peasant Polish music. Some of his mazurkas were influenced by Jewish wedding dances. At 15 years of age, he learned to play the Aeolmelodikan, a combined piano and organ. Tsar Alexander 1 appointed him organ master for the Church of the Lyceum at Sunday morning mass. "Oh, my Lord, what a personage I have become—the first in importance after his Reverend the Priest." Chopin pioneered a new kind of piano playing—daring and refined with a harmonic sense. It was "the singing right hand, the arpeggiated rainbow chords in the left, the invented variants added to the main melody whenever it reappears, and the whole texture washed in color by the sustaining pedal." He also introduced a form called "rubato" in which the rhythm is altered but never the basic meter. It's similar to a variation of line in a drawing by a master artist. But he disdained program music. His contemporaries—Liszt, Berlioz, Mendelssohn and Schumann—wrote notes to explain their music. But Chopin was like a displaced person, "a classical composer in word and deed, condemned to walk in silence among the charming Romantics." However, he did come to be known as the "Prince of the Romantics." Chopin could improvise on any piano. On one of his travels the carriage had to stop to get new horses. But they weren't ready yet. He then discovered an old piano in the market square on which he began to improvise Polish melodies that attracted an audience. One of the pieces was a Polish Fantasia that later turned into the Grand Fantasia on Polish Airs for Piano and Orchestra, Opus 13. In 1829, he fell in love with a young singer, Konstancja Gladkowska, when he attended one of her concerts in Warsaw, but was too shy to tell her. She inspired the Larghetto of the F minor Piano Concerto, which contains one of Chopin's most ravishing melodies. "It reaches such expressive heights that the roulades and grace notes with which it is adorned become virtually indistinguishable from the melody." He was labeled the "Paganini of the Piano" when he played this concerto to a small ensemble at the Krasinski palace. He also wrote a group of Polish songs about his suppressed feelings for Konstancja. He finally met her but, alas, her mother arranged a marriage to a wealthy gentleman. In 1833 Chopin decided to create a new world in the life of piano music. And, indeed, he did. Heinrich Heine, the German poet, named him the "Raphael of the Piano." "When he plays, I forget all other masters of the instrument, or mere skill, and sink into the sweet abyss of his music, into the melancholy rapture of his exquisite and profound creations." He didn't consider technique as an end in itself. His nocturnes relate his love affair with the human voice, "whose inner spirit comes from the world of opera and that style we call 'bel canto.’"
He was the only composer to attribute individual personalities to each finger that touched the piano keys. "Each finger had a separate role to play and the ten fingers represented nothing less than a palette of differing hues, enabling him to color his interpretations in a variety of shades." It was color, nuance and phrasing that set him apart from other pianists who concentrated on technique first. Illustrations show the connection between the keyboard and the human hand. Chopin had a short stay in England in 1837 and wrote his impressions of that country: "What enormous things they have here! The urinals are huge, but there is nowhere to have a proper pee!" Throughout his years in Paris, he always felt that he was in exile and yearned for his homeland. His mazurkas reflect his nostalgia for Poland, which was eventually wiped from the map and absorbed into the Russian Empire. When he learned of this event, he wrote: "I am . . . only able to pour out my grief at the piano." In 1849 Chopin's health reached a critical stage ,and he was confined to his bed. He died that year in Paris of a respiratory illness at the age of 39. It was unfortunate that George Sand, for reasons unknown, burnt all the ten-year correspondence between her and Chopin. The public has lost one of the most important chapters in the composer's life. Chopin had left instructions to burn his unpublished manuscripts. However, one of his sisters decided to publish them. The world would have lost some major works had she listened to his wishes. This highly readable and engaging biography by an authority on 19th century Romantic music is suitable for professional musicians as well as music lovers and piano aficionados. It brings to life one of the 19th century's and Poland's most beloved, legendary, and celebrated artists. It deserves a place of merit at every university, music, and school library.